ScanMe – Unique, Personal QR Barcodes For You And Your Business! In my line of work I regularly get to hear about lots of great new business ideas and start-ups but here’s one that I think has huge potential to bring online and offline communities together, whilst enabling tech-savvy and fashion-conscious people to share private messages and information with each other around the world! ScanMe is an exciting new application that allows individuals to create their own unique 2D / QR Barcode containing links to all their social media profiles (Facebook, Twitter, LinkedIn, Flickr, Skype), website, email address, telephone number and personal message or short bio. It’s completely free for users to create their code by visiting www.scanme.com and logging in using their existing Facebook details. Once the code has been created, they can download it to their PC or laptop and share it with anyone they like. The recipient or viewer then simply scans the code into their smartphone (using a QR reader app) to reveal all your contact info! The code will never change in appearance, but you can login to add and edit the info contained within it whenever you like. As someone who is using all the social media tools listed above for business on a daily basis, I think this is a really excellent way to compile all my contact details into one handy place which I can then share with all my business contacts online (i.e. as an avatar or profile picture) or on printed materials (like business cards). 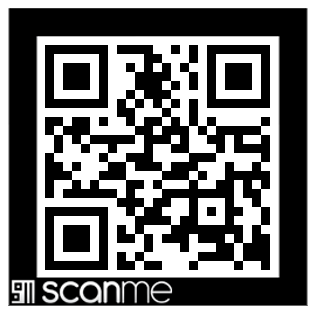 For example, my unique ScanMe barcode is shown below. To see how it works, take a photo/scan it into your smartphone to reveal my contact details! The official launch date for the fully functioning ScanMe website is Monday 9th May but for those of you who are super-keen and like to be ahead of the pack you can create your code now at www.scanme.com to see how it works, and then add further info to it next week. Furthermore, after 9th May, users can incorporate their own unique ScanMe code into a range of clothing items and t-shirts dubbed ‘Interactive Fashion’ featuring exclusive designs by world-renowned artists like Ray Ban and Wired magazine designer Matt W. Moore. Very cool indeed!